Home » Film » Want to See Infinity War with Donny Cates and Jim Zub or Deadpool 2 with Fabian Nicieza? Want to See Infinity War with Donny Cates and Jim Zub or Deadpool 2 with Fabian Nicieza? You could see Avengers: Infinity War anywhere. With anyone. But what if you could see it in Calgary, Alberta with the writers of the Avengers and Thanos comics? Comics veteran charity The Hero Initiative is auctioning off a single ticket to see Infinity War on Friday, April 27th at 9:55 p.m. at the Scotiabank Chinook Theater in Calgary, Alberta alongside current Avengers writer Jim Zub and Thanos writer Donny Cates currently at $93 on eBay with bids and four days to go. That’s not the only Marvel comic book movie out in the next month, of course. 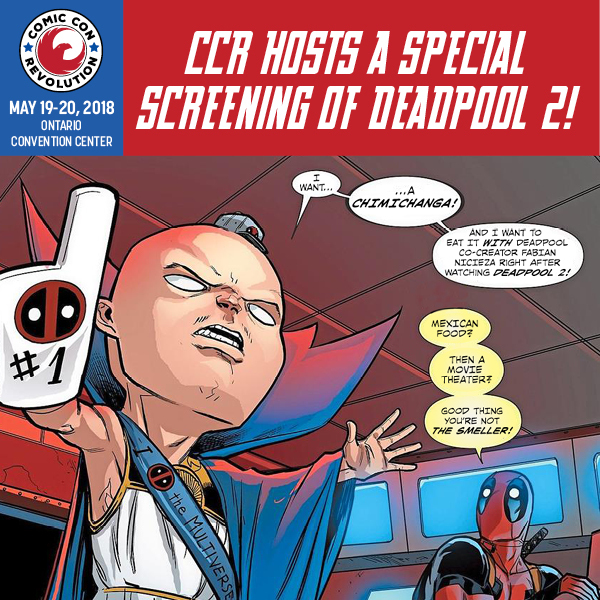 Deadpool co-creator Fabian Nicieza will be hosting the opening of Deadpool 2 on Friday, May 18th with a Q&A and loads of other stuff in the morning at an Ontario cinema as part of Comic Con Revolution along with ticket buyers. And there are levels of tickets to buy, from $30 to $125, including a Chimichanga meal with Nicieza.